Everyday activities such as gardening and heavy lifting to poor posture when slumped at a computer, we are putting strain on muscles and connective tissue that fills out bodies. One reaction to all of this stress is pain, tension, soreness and restricted movement. The body’s solution to this potential harm is by signalling on the fibroblasts, the cells that make up connective tissue that fills the gaps, to lay down extra collagen in order to keep it elastic and support the ‘new’ posture (albeit a bad one!) that the person has adopted. The extra collagen, or scar tissue, upsets the levels of water and elasticity within the tissues, leading to hardened areas where lack of oxygen adds to the overall imbalance. See those ‘bumps’ in the muscle in the picture above? They are known as Trigger Points or the knotting that we are all so familiar with. My job as a massage therapist is to deal with trigger points on a daily basis, it’s from my frustration at how these little blighters will not budge that I have read constantly on how to eradicate them! By returning the scar tissue to a normal texture through specialised massage, the client can expect to have an increased range of movement, less pain, better sleep and even fewer headaches. It’s not always a pain free experience for the client when trigger points are palpated and worked on. These areas can be the size of a pin head to a small pea and by locating these in a slow and measured way, with plenty of communication from the client during treatment, I can help to release them. 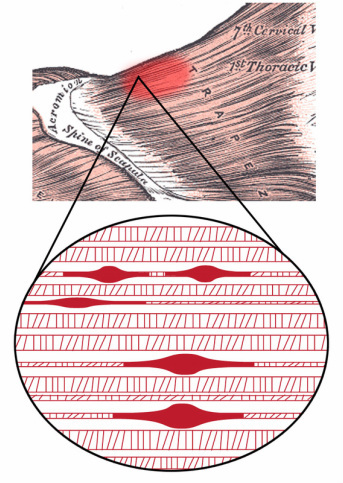 Above is a chart of known points in the trapezius muscle of the upper back…on just one side! Some clients will feel a ‘referred pain’ when trigger points are worked on, meaning that I can create a pain map similar to the one that they have complained about. This could be seen as a stiff neck (usually one sided), pain on lifting the arm above their head and a dull ache or pins and needles down the arm and into the hand. It is this bingo! moment of recreating this map that can ultimately find the correct trigger point/s to help heal them.